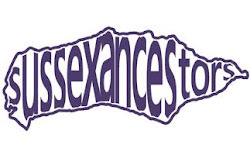 Sussex Ancestors: Too many children! This burial is recorded in the Frant registers and that Emma had four children in such a short space of time is confirmed in the baptism register. There is only 9 months and 11 days between the two baptisms; it is likely that Emma and Mary were born on the 19th January 1800 meaning that John and Joseph were born early in January 1799. John Moon had married Emma Adams in Wadhurst on the 21st October 1798, which is about two months before they were born. Emma must have been pregnant most of her short marriage. Sadly mum Emma's death was followed by that of daughter Emma who was buried on the 7th May 1800 and Mary who was buried on the 6th May 1801. Both John and Joseph appear to have survived childhood.